What are your plans for Christmas 2018? Are you visiting your family to swap presents and enjoy a home cooked meal? Maybe you’re looking forward to a night out with friends, or perhaps you’d prefer a few cosy evenings in, watching the television? For someone like Mike, the simple joys of Christmas such as cooking a meal or watching a film, can be a real challenge. Earlier this year Mike developed Guillan Barré syndrome, a rare, but serious, autoimmune disorder where the immune system attacks healthy nerve cells. This leads to weakness and numbness in the limbs, and can cause paralysis. The cause of Guillan Barré syndrome is unknown, but it’s typically triggered by an infectious illness, such as stomach flu or a lung infection. As a former bricklayer, Mike was used to leading a fit and active life, but developing Guillan Barré syndrome left him with severe weakness in his upper limbs, and for the last two months he’s been a patient here, where he’s currently undergoing rehabilitation. A vital part of that rehabilitation, is the time he spends in our Compass computer room with Barnaby, our technology support worker, and Natalie, his occupational therapist. 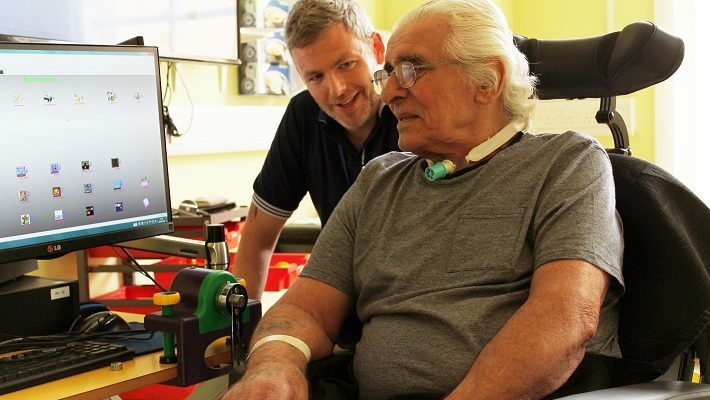 Playing games on the computer with Technology Support Worker, Barnaby, has helped Mike combat the muscle weakness resulting from his illness. The Compass Team at the RHN offer a wide range of assistive technology services to our patients. These include an initial assessment of their abilities when they first arrive, games and activities designed to improve mobility, cognitive function and memory, as well as leisure activities such as using the internet. 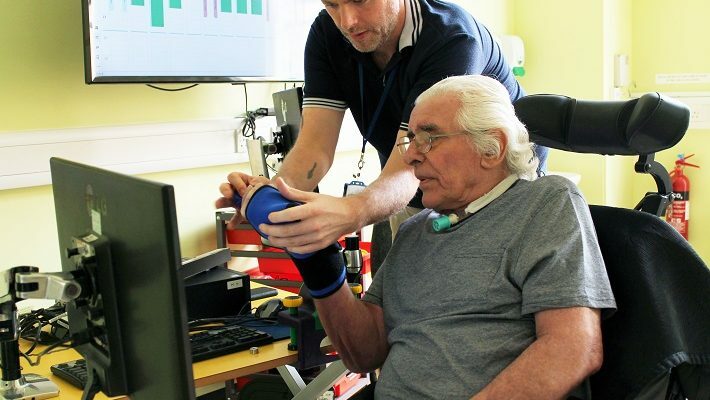 Mike’s therapy sessions involve a variety of computer games designed to help him improve his upper limb and grip strength, through the use of a specially adapted game controller. When Mike first arrived he could barely hold the game controller, but weekly sessions in the Compass computer room over the last two months mean he’s made great strides on the road to recovery. He can now operate a Kindle, so he can read books and a specially adapted switch means he can change the channels on his TV without assistance. Barnaby, Mike’s technology support worker. A special wrist brace allows Mike to operate an adapted game controller, improving the grip strength in his hands. That dedication to his rehabilitation means Mike is looking forward to being back at home in time for Christmas, and, like many of our patients, it’s the simple activities of day-to-day life that he is looking forward to most. The Compass computer room is one of the most popular services we offer to our patients. The games and activities our therapists use are fun and challenging and provide our patients with a real sense of their own progress. Every year we have to raise £80,000 to offer this vital facility to our patients. The time they spend in the computer room not only equips them with the skills they will need when they return home, it’s also a chance for them to have fun and celebrate their achievements. This Christmas will you support our other patients like Mike with a gift in aid of our Compass Computer Room? What many people fear about living with disability, is that their life will be diminished by it. The work of our Compass Computer Team means we can give hope to our patients that they will adapt to their new life and find a new way of living. Your gift will ensure our patients can enjoy the benefits of access to technology. It’s that simple. Whatever amount you can afford today will make a huge difference, we hope you have a wonderful Christmas.